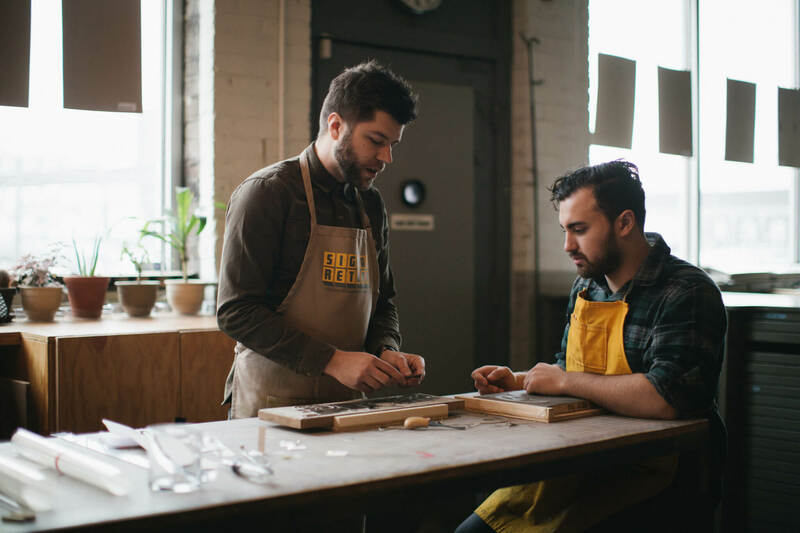 From traditional performing arts to child education programs to the revival of letterpress printing, the arts are thriving in southeast Michigan. Residents of southeast Michigan might participate in a workshop given by the historic Pewabic Society in either Wayne, Macomb or Oakland County, or take in pop-up modern art exhibitions in Washtenaw County. They can experience the transformation of the historic Heidelberg Project into a vibrant artist community. The region’s cities and neighborhoods are bursting with examples of unique art genres that appeal to and are relevant to all demographics. Arts and culture destinations in Michigan generated 12.6 percent of Michigan’s leisure travel spending in 2016, contributing $1.3 billion in direct tourism, according to the 2018 Creative State Michigan Report. In addition, nearly 4,000 arts education programs served almost 74,000 students that year. One of the hallmarks of the Community Foundation is funding all sizes and types of programs and initiatives, prioritizing grants across the region with the intent of lifting communities, and supporting art genres that appeal to and are relevant to all demographics. A teacher uses music to engage young learners in a Living Arts Detroit Wolf Trap class. The Community Foundation partners with organizations such as Living Arts, an almost 20-year-old organization deeply entrenched in southwest Detroit. 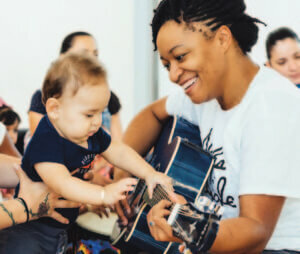 In July, the Foundation helped fund the expansion of Living Arts’ Detroit Wolf Trap, a program providing professional development, mentoring and coaching for Detroit-area early childhood educators, parents and caregivers. Investing in arts education, particularly for children, is an important part of the Community Foundation’s support of cultural programs. When introduced at an early age, the arts can positively impact academic performance and influence career choices. The Community Foundation partners with organizations such as Living Arts, an almost 20-year-old organization deeply entrenched in southwest Detroit. In July, the Foundation helped fund the expansion of Detroit Wolf Trap, a program that provides professional development, mentoring and coaching for Detroit-area early childhood educators, parents and caregivers. The funding trains them in performing arts-integration strategies through classroom residencies and professional development workshops. Artist residencies in schools across Detroit and robust out-of-school offerings have shown to increase academic achievement, develop leadership and artistic skills, and strengthen schools and communities. Funding also supports unique projects such as Signal Return, which launched seven years ago as a letterpress print shop catering to a growing Detroit arts community through workshops, educational partnerships with universities, elementary and high schools, and collaborations with area arts and culture organizations. Signal Return leads the Detroit revival of letterpress printing, a technology that transformed human communication in the 15th century. It offers free programs that are open to the public such as poetry readings, book release parties and exhibitions with partners that include Literary Detroit, the Ferndale Public Library, Oakland University, Wayne State University, the University of Michigan, and local businesses such as Shinola. Community Foundation support enabled Signal Return to expand its educational offerings, including hosting workshops with three New York-based and local artists. A small portion of the grant allowed Signal Return to purchase a rare printing press, one of the last of its kind in the world. The Community Foundation awarded Signal Return a grant that enabled it to expand educational offerings, including hosting three New York-based artists for workshops not previously offered at the shop. It also added workshops by local artists. A small portion of the grant allowed Signal Return to purchase a rare printing press, which is one of the last of its kind in the world. With the additional printing press, the organization has been able to increase its educational offerings and print with greater volume to boost earned revenue. Prior to the Foundation grant, Signal Return had three printing presses all fabricated in the 1930s–1950s. These presses were originally used in commercial print shops. As the print industry changed, presses were phased out of commercial shops and integrated into printmaking art studios. New presses are no longer being built, and there are a finite number of these crucial teaching tools in circulation. Smaller organizations such as Signal Return are just as significant to the region’s arts and culture offerings as larger, historic institutions such as the Pewabic Society. A recent Community Foundation grant allowed Pewabic to hold exhibitions at various sites including Detroit’s Belle Isle Nature Zoo, Cranbrook in Bloomfield Hills, the Jewish Community Center in West Bloomfield, the Warren Public Library and the Anton Art Center’s Boll History Gallery in Mt. Clemens. Thanks to Community Foundation support, Pewabic Pottery implemented a traveling and on-site ceramic art exhibition series that included a number of exhibitions and workshops held at Pewabic and at various sites throughout the metro Detroit area over the past year, including “This is the living vessel: person. This is what matters. 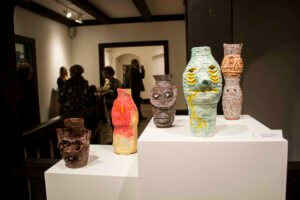 This is our Universe,” curated by Cranbrook Artist-in-Residence and Head of Ceramics Anders Ruhwald. With increased visibility in Oakland and Macomb counties, Pewabic increased visitor attendance and revenue streams. It also led to securing ceramic artist Bobby Silverman to serve as juror for its final 2016 exhibition, “Ceramic Tile 2016,” which boosted entries by 30 percent over the previous year, with entrants from 17 U.S. states, China, Finland and Hungary. Throughout the series, Pewabic expanded its audience to a broader representation of southeast Michigan, including regional college students, and city and suburban residents. exploration and collaboration. Ann Arbor’s Liberty Plaza transformed into an outdoor art pop-up exhibition over 10 days. The “pop-up” exhibition engaged the community in bold and playful arts experiences. Artists from Ann Arbor, Ypsilanti, Detroit, Denver and New York showed art that included video, chalk, film, flowers, encaustic paper, architecture and mixed media in nine 100-square-foot pop-up pavilions throughout the plaza. The festival included a speaker series at the downtown Ann Arbor District Library, a daily music series, and a family-friendly afternoon featuring artist talks and hands-on art-making activities. With 6,680 attendees, the Art Center drew visitors from a wider demographic than in prior years, including students, youth, and young professionals from Ann Arbor and nearby cities. Its goal was to expand its audience beyond Ann Arbor and attract young professionals. In Detroit, the Historic Heidelberg Project is currently celebrating 30 years with HP 30, which marks three decades of artist Tyree Guyton’s outdoor installation on the street that gave the name to his most famous work. Over the years, the project grew from his childhood home to span two city blocks, becoming an artistic refuge for locals and visitors from around the globe. Thirty years later, the Heidelberg Project is a Detroit landmark that is internationally recognized as a demonstration of the power of the human spirit and the resilience of the city of Detroit. The Community Foundation’s current support of HP 30 is funding parts of the anniversary celebration, which includes a partnership between Heidelberg and Shinola to install a clock on Heidelberg Street, artist talks, winter solstice events, and an oral history lecture with a distinguished Wayne State University professor. Outdoor film screenings, a mural installation in Eastern Market and a photo retrospective at the HP Numbers House drew thousands of visitors. The Community Foundation supports art forms of all genres that show the potential to strengthen the breadth and depth of arts and culture offerings across the region. Each organization adds to the vitality of the region, and enhances the lives of individuals of all ages and interests.